It had been our dream to take our family to a far-off place and learn another language. We began living our dream. We moved to Akita, Japan and it was incredible. Unfortunately, the tsunami and earthquake devastated the neighboring provinces and we were also worried about radiation. We decided to stay in Japan, and we helped collect funds and donated fruit which we sent to the devastated areas. Shortly after, we found out we were expecting our 2nd child and began to prepare to give birth in our local hospital. Even though my wife had an ultrasound at every prenatal appointment, it wasn’t until she was 33 weeks along that her doctor detected something wrong with our son’s heart and sent her for a detailed fetal echo. Grave faces and hushed voices followed. Our son was diagnosed with Hypoplastic Left Heart Syndrome (HLHS) and we were in shock and disbelief. The ground seemed to be shaking again. I tried not to listen to my wife as she explained what she found out about this condition thanks to the internet. I turned up the volume on the TV louder so I wouldn’t have to think about it (denial). To stay in Japan, we would need to relocate to Tokyo or Osaka for the surgeries needed. And with no family around, the language barrier, and the financial burden that it would be, we quickly realized that going back to Canada was our best option (thankfully our Alberta Health Care coverage was still active). What followed was a hectic time in our lives – packing up everything and moving back to Canada in a rush. She was 35 weeks pregnant and you can’t fly after 36. After arriving home, we quickly began a series of appointments in Calgary, eventually finding our way to the Stollery in Edmonton. What followed is something most of us know about all too well. Twice, we kissed Josh good-bye as he was wheeled off for open-heart surgery – we hoped it was not sayonara. Josh was in hospital for 6 weeks after the Norwood and dealt with feeding issues and left vocal cord paralysis. Once home, Josh thrived and began gaining weight and exclusively oral feeding. When I wasn’t depressed about having no job and money, I was so happy! His Glenn procedure was done when he was 3 months old and he was in the hospital for 2 weeks. The support and care for us by family and hospital staff was overwhelming. The accommodation was extra-special. We loved our stay at Ronald McDonald House, of course we don’t want to be sick again, but we sure miss that place. As native Canadians and newcomers we all became instant friends as we exchanged supportive knowing glances in kitchens and elevators. I don’t know what the ending to this story will be. But, right now, we are so happy that Josh is doing very well. His energy and smile are blessings to us. Our daughter was also affected the last year and a half. She shows her own child-like response by praying each day for two things. First, for two babies who are still in the hospital and second, for “all the babies in the hospital.” We echo that. In January, 2007, my husband and I were delighted to find out we were expecting our first child. However, our excitement quickly turned to despair when, at our 18 week routine ultrasound, our technician had difficulty seeing all four chambers of our baby’s heart. She left the room and returned soon after with two senior technicians. As they took turns looking at our baby’s heart, our worst fears were confirmed; our baby would be born with a series of complex congenital heart defects. The months leading up to the birth were filled with appointments, multiple echo cardiograms, and a birth plan that would require traveling to Edmonton to deliver the baby. The prenatal diagnosis was pretty grim and included Double Outlet Right Ventricle, Pulmonary Stenosis, and Dextrocardia. We were given the following options; compassionate care, which means no intervention, allowing nature to take its course, a heart transplant, or a series of three palliative surgeries which would reroute his circulation to alleviate the burden on the one pumping chamber. We chose the surgical route, and when our baby boy was born that fall, he was immediately transferred to the Stollery Children’s Hospital in Edmonton for surgical assessment. Perhaps our greatest disappointment the day of his birth was that we were not permitted to hold our son before he was whisked away by the transport team. When I was finally able to see him for the first time, he was already intubated and was hooked up to numerous wires and machines. Over the course of the next few days, it was determined that he would skip the first surgery (called the Norwood) thanks to another heart defect he had called pulmonary stenosis, which in his case, was actually helping to prevent his heart from becoming overloaded. For the first time, we began to feel optimistic and after a month of hospitalization, we were finally able to take our son home – albeit with a nasogastric tube (NG tube) and oxygen. My husband and I took a crash course on inserting and removing the tube, a nerve-wracking job when our test subject was our four week old son! When Roman was just three months old, we returned to Edmonton where he received the first of his staged surgeries, the Glenn. He came through the surgery with no complications and we were home in a week! From that point on, Roman began to thrive, grow and reach all of his milestones. Just as he was turning 3, his sats began to decrease and it became evident that his need for the last of the palliative surgeries (the Fontan) was approaching. We were sent up to Edmonton for a heart cath to make sure the pressures in his heart could sustain the Fontan. During the cath, they ended up coiling off several collateral veins that had formed due to his decreased sats. Soon after, he successfully underwent the Fontan. Again, he spent just one week in the hospital. Roman’s surgeries were performed by Dr. Ross, a tremendously talented cardiac surgeon to whom we will be forever grateful. He is seen yearly by the equally talented Dr. Dicke, the pediatric cardiologist who has been following him since he was an infant. We know we are in good hands with both the Edmonton and Calgary team. While these surgeries are palliative and not a “repair”, we hope they will tide him over to adulthood when other treatments, perhaps through stem cells or other medical advances, will be available and allow him to live a normal lifespan. Today, our son is doing all of the things that other kids his age do; he goes to school, rides his bike, skis and plays soccer and t-ball. He is happy and carefree, and doesn’t remember a thing about his surgeries other than the play room! While we don’t know what heart problems await him in the future, we focus on living day to day and celebrate the positives in our life. When I was just 12 weeks pregnant, we went for our very first ultrasound. The tech was very chatty, telling us all about his family and excitedly showing us on the screen the picture of our unborn baby, pointing out his tiny hands and feet. All of a sudden, he went silent and appeared deep in thought. He then excused himself and left the room. When he returned, he said everything was fine and he’d see us soon. The next day, I received a call from my doctor and was sent for a more detailed ultrasound at the Foothills Hospital. There I was greeted by Dr. Fruitman, who told us that our son had a severe congenital heart defect and explained what that would mean for him. The rest of my pregnancy was filled with uncertainty and fear. Jax was born on July 21, 2010 with Hypoplastic Left Heart Syndrome (HLHS) and criss-cross heart, a rare defect where the left and right ventricles are twisted - in this case, so much that they turned his heart around. The repair, we were told, was common, a 3-stage surgical intervention; a Norwood at 7 days, a Glenn at 5 months and a Fontan at around 3 years. Many children are able to go home only weeks after the Norwood, but not us. 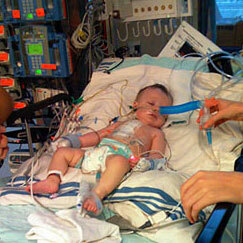 After we returned to Calgary, Jax's left lung collapsed. We learned that he had sustained nerve damage during the Norwood leaving his diaphragm half paralyzed. We went back to Edmonton to suture it so that it would no longer be in the way of this left lung. He was only in Edmonton for a week this time, but would need to stay in hospital until after his second staged surgery, the Glenn. We brought our son home on Christmas day. He was finally off oxygen, we were so happy to have him home and to this day we feel very lucky. Jax has big problems with acid reflux, and vomits every day. Needless to say, he doesn't like to eat so we are G-tube feeding him a high calorie formula to help him grow. Getting him off the tube feeding is now our biggest challenge, but for now it’s okay. We doubt he'll take this tube to college! January 19th 2017 was a day I’ll never forget, it was the day I found out there was something wrong with my baby’s heart. The local hospital radiologist called my family doctor who was away on vacation so her locum called me and asked me to come in and see her straight away. The first thing I asked was “ Can this baby survive?” She further proceeded to say come straight in straight away. I whisked straight into a room and within minutes she was in the room telling me they think my baby had Hypoplastic left heart syndrome (HLHS) however I had to go to Calgary for more scans. The next six days until our appointment in Calgary was a blur, I was crying constantly not knowing what to expect. My older child would come over and hand me tissues and pat my eyes which made me cry even more as she had only just turned two years old. At our appointment they spent several hours scanning me to the point where the cardiologist came into the room to look first hand on the screen as she wanted to see different angels of baby’s heart. We sat in the room to meet with her and she said “What have you been told ? I proceed with the HLHS diagnosis and she continued to say “It’s not that but there is something, your baby has an interrupted aortic arch type b ( IAA )and a ventricular septal defect (VSD). She then proceeded to explain that my baby would require life saving open heart surgery within the first week of her life to correct it so she would have blood flow to the lower half of her body and patch the hole in her heart. I would relocate to Edmonton to give birth and my baby would have surgery at Stollery Children’s Hospital. We then met with further doctors with regards to performing an aminosenteaious as there was a possibility that baby may have a genetic condition called 22q11 deletion syndrome as this type of defect can be associated with it. We chose not to perform this test as it would not change or decision to have our child. Then many appointments followed in preparation for her arrival. When I was 33weeks and 6 days along I noticed that I hadn’t felt her move since the day before and went into my local ER. They tried to call STARS to helicopter us to Edmonton but given it was the Saturday of the Easter weekend they were backed up for six hours so sirens and lights to Foothills medical centre in Calgary for further scans. After a bedside ultrasound and detailed ultrasound by a on call doctor it was decided that she was going to be born that night but the question was where? Edmonton or Calgary. She was going to speak with our cardiologist and get back to me. Calgary it was as she needed to come out, fast. First I was told we could go through induction however it was then decided her heart couldn’t take labour so we proceeded with an emergency c- section. Aurora was born on the 15th of April at 11:21pm weighing only 4 pounds and 5oz (1.9kg).The NICU team were in the OR and began working on her straight away and I got a side glimpse before they whisked her off to the NICU to get her settled. The following Tuesday we went to cardio conference and it was decided that we would wait in Calgary and grow her to 2.5kgs for surgery. In my eyes it was extra time with my little girl for snuggles and kisses before her surgery. Three days later we were told that we were being moved to the NICU at Alberta Children’s Hospital, it was exactly what I was asking for and then my phone rings. It was our genetic doctor calling to tell me that my beautiful precious Aurora has 22q11 deletion syndrome and that is was indeed what caused her heart defect. There are 180 different outcomes of 22q11 deletion syndrome and each case is affected differently so many more tests followed.We planned to meet later that day to further discuss. The fist six days of Auroras life a lot happened earlier than I planned, it was a whirl wind. That night when settling her into her new accommodation for the next coming weeks it was the first time I took and breath and relaxed. The NICU at ACH would become my “home home” as I would call it. We tried to grow Aurora to 2.5kg but she was going into further heart failure and requring more respiratory support so at 2.1kg we were flown up to Edmonton to have surgery. On May 26th 2017 (1 day before her due date) was the day they wheeled my little girl off to the OR for surgery. That day was one of the hardest days of my life. It was a long 5 hours we waited until I got to see a glimpse of her between the OR and PCICU. Our amazing surgeons were able to use her own skin for the arch repair and bovine on her vsd patch. We proceeded to then wait another hour so they could get her settled in, however Aurora had other plans. After an hour of waiting was up we walked into PCICU and there was our little girl surrounded by doctors and nurses and countless machines. She had four nurses working on her as she was losing too much blood and didn’t know why. Many hours later they got her bleeding under control. Our PCICU nurse that day saved her life and if they didn’t stabilize her I don’t know what would of happened. After a few days she was sent back the NICU and then a week and a half later we got the all clear to go back to ACH in Calgary. I was so happy we were getting moved closer to our home. We then spent further time in the NICU and then onto unit two. At this time I found out that Aurora has another heart defect called a Bicuspid Aortic Valve which means that her valve has two leaves instead of the normal three but right now it is operating as a normal valve but likely overtime will need surgical repair., meaning another open heart surgery. We continued to work on eating and growing before being discharged at 89 days old with oxygen support at home. Our lives today consist of many follow up appointments and we don’t know what else 22q11 deletion syndrome will bring us. For now it affects Aurora’s immune system, eyesight, heart , delayed growth and development but for now we are enjoying our time at home with her big sister giving her lots of kisses which causes Aurora to go have endless giggles and it reminds me that everything we went through and will go through to have her here with us is worth it. If you wish to learn more about Aurora and her journey with congenital heart disease and 22q11 deletion syndrome please search Aurora’s Special Heart on Facebook for recent updates.